Most Hated Hero: Zen. Archon simply can't understand why Zen is so relaxed all the time. Being relaxed is boring! Life is about burning brightly with passion and vigor! Why would you want to sit around on a little cloud not being expressive?! ETHEREAL: 20% Damage Reduction and health does not drop below 1 on the first turn. This effect can't be stolen, copied, or purged. ARMORED: Takes less damage from physical attacks. WARRIOR'S SOUL: Warrior allies gain 5% Attack and Max Health. SOULREND: Armor-piercing basic melee physical attack. BURNING BERSERK: Melee physical attack on target and 3 random enemies with 100% base chance to Soulfire Burn on hit (Damage over time debuff that permanently reduces Max Health). WARRIOR'S SOUL II: Warrior allies gain 10% Attack and Max Health. COMBAT PROWESS: Melee physical attacks have a 100% base chance to Impair on hit (reduces Crit and Epic proc chance to 0%). SIPHONING SUNDER: Steals 1 Buff from all enemies, then melee physical attack on single target. Damage multiplied for each buff on this hero. WARRIOR'S SOUL III: Warrior allies gain 25% Attack and Max Health. PRIMORDIAL VIGOR: Starts with +1 Energy for each other Warrior or Spirit ally on the team. WAR INCARNATE: When this Hero is killed, all allies gain +10% attack buff, this Hero's corpse is removed, and the ally with the highest Attack becomes Soul-tethered. When a Soul-tethered ally is killed, this Hero is resurrected in that character's position. Soul-tether can't be stolen, copied, or purged. 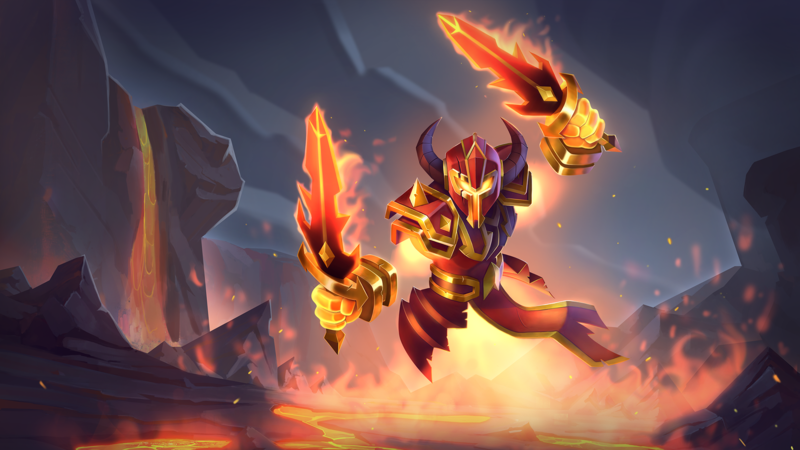 CATACLYSMIC CONFLAGRATION: Sacrifices self, dealing shield-piercing damage to all enemies with 100% base chance to purge all buffs and add Soulfire Burn to enemies hit. Removes all enemy corpses. Can't be dodged. Oh god, so we either have to kill him last - or- stuck with kill him, kill all the enemies leaving the soul-tethered one last (even tho we won't know which one that is). And then finally kill him a 2nd time with no allies on the field. I dunno. He sounds pretty cool. Too bad he has to be 5 star to FA, meaning you either drop a thousand bucks on him or else just forget he’s in the game. He’ll be long out of the meta by the time you can collect enough tokens to make him usable at his sweeeeeet legendary 0.66% boosted portal drop rate. dude this hero sounds littttt. he looks awesome too. This star related ascension is garbage. All you give out are evos. Evos we cannot use due to the fact there so few hero tokens to be gained. Do you really think devs are gonna change it to how it was. That would be less money in their pockets even though it would keep the player base alive and happy. Did 50 portal pulls. Didn’t get new hero. The rates on these things are atrocious. You should at least make it a single guaranteed unlock for the first 10x you do during the event. Let people at least reasonably acquire the new hero, even though he won’t be usable. 😒 Another inflationary legedary hero. Just gonna bring this up, but with the Soulfire debuff, since it is a unique “burn” debuff, shouldn’t it also apply to the furnaces basic attack “feel the burn” to the list of random burn debuffs? Yet another new hero that will sit in my roster with 1-2 stars, unused, unascended. At least Zulkodd and Jumbeaux have a new "legendary" hero to keep them occupied on the bench. I ironically got him on my first try, which is really lucky. I didnt even expect to pull him, i was just using a daily quest reward. Can someone explain to me why both of the post update new heroes are legendary? They are aware that he's just gonna be collecting dust in most people's roster because he takes 5 stars to fully ascend right? Don't get me wrong, I appreciate what this hero has to offer, and he does have pretty good traits that define what a legendary hero is, but if this trend continues, then something's gonna have to be done about the game's problems fast, otherwise it's only going to add another tick to the corporate greed. 1. What happens if he dies with a Solaris fether? 2. Wouldn't Zomm be able to create an endless Archon supply as he fills the empty spot with a Zomminion? 2. I'm pretty sure the stats of Zomm's minions are lower than Zomm's own stats (correct me if I'm wrong), so no he wouldn't be able to make an endless Archon supply because Zomm would be the one to get the tether, and once Zomm is dead, the whole thing comes crashing down. Maybe if you have the right allies, you might be able to have Archon revive more than once? But even so, it's only a matter of time until Zomm gets the tether because Archon burns the corpse of the tethered ally upon their death and upon his revival. I'm not 100% on the Zomminion mechanics, but as I understand their stats are based on their live stats. If you have, as you should, a defensive Zomm, but an offensive deceased hero, then the Zomminion should have better attack then it's master.